The 20th century was the noisiest century in the history of the world, resulting in the greatest loss of natural quiet in the history of the world. 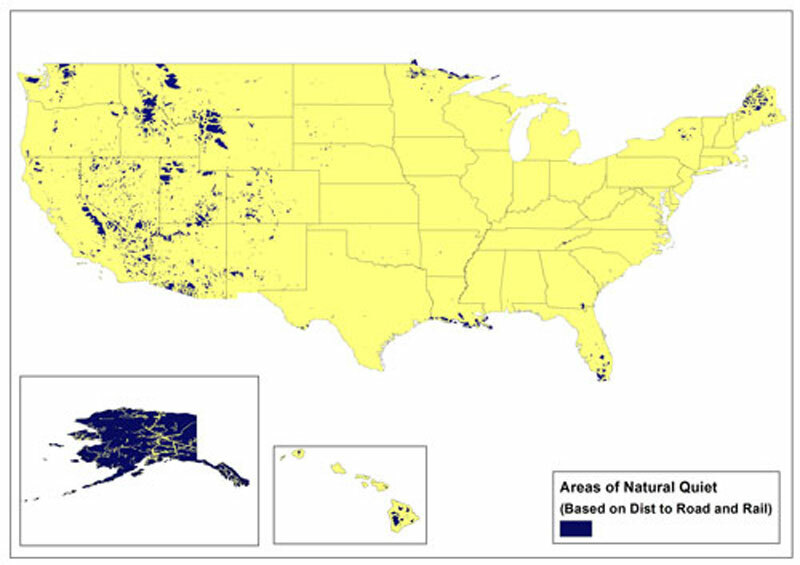 Noise spread into previously quiet lands, penetrating suburbs, rural areas, and even protected wilderness areas . Will the 21st century set a new record for noise, or begin a new era to bring back quiet? What noises will dominate the 21st century? How will we think about noise, and what, if anything, will we do about it? This paper explores the future by listening to what happened in the past. When we started burning fossil fuels in internal combustion and jet engines humanity developed the ability to really make a racket. In 1900, Ford and Harley Davidson did not exist. The Kitty Hawk flight had not yet occurred. 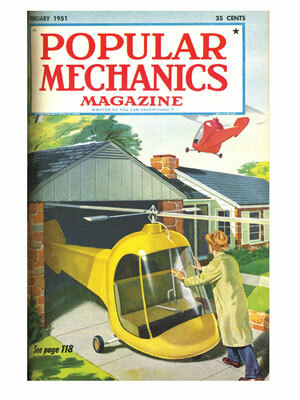 Yet, shortly after inventing the car and plane, we started driving and flying them more and more, practically everywhere. By mid-century, road noise (cars, trucks and motorcycles) and aviation noise were, and would remain, the top two noise sources in the United States . Figures 1 and 2 show the growth in vehicle traffic. Vehicles and planes were not alone in littering our environment with acoustical trash. Industry, energy production, resource extraction, and a long list of newly invented noises all contributed. Together, these emerging stationary and mobile sources followed our sprawl into previously quiet areas,  making the 20th century the undisputed noise champion. It was this spread of noise that caused the unprecedented loss of natural quiet in the 20th century. Nowhere is this clearer than with vehicle noise. Figures 3 and 4 show quiet areas in 1900 and in 2000. 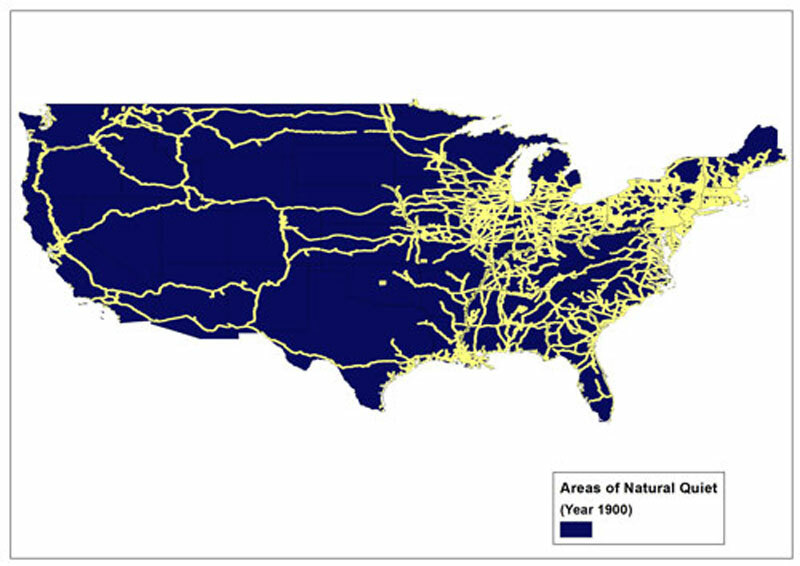 These maps were created using a simple acoustical model (population, roadways, waterways, and railways in 1900 and today). The blue represents areas where one had or has a good chance of finding natural quiet. 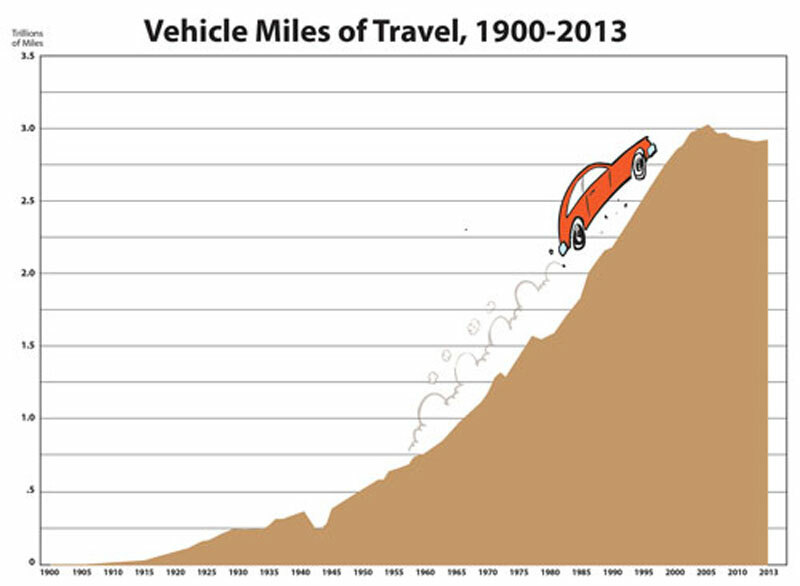 In 1900, 20-25% of the continental US was impacted by vehicle noise; in 2000, 97.4%% was impacted. Planes finished the task of destroying natural quiet in the second half of the 20th century, flying over the few remaining quiet areas. 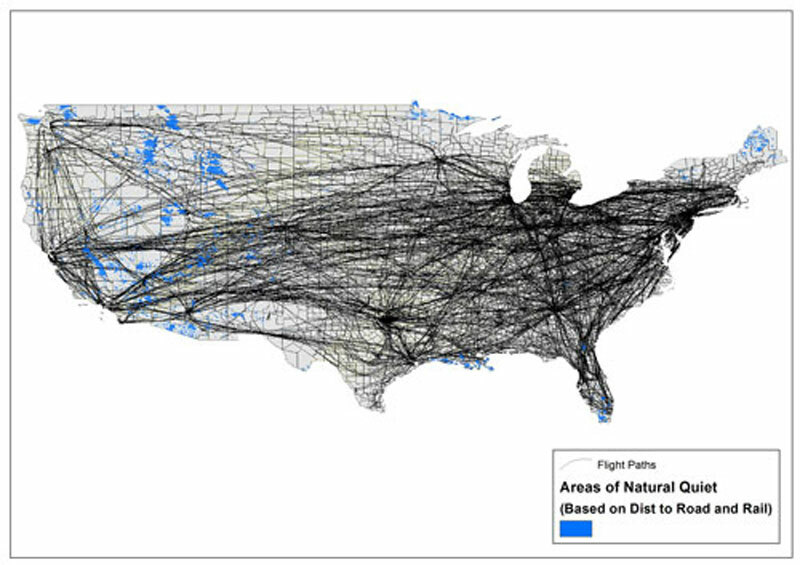 Figure 5 imposes commercial aircraft overflights on the map of quiet lands from Figure 4. During the 20th century, it could be said that noise abhors a vacuum. The primary lesson of the past is that the spread of transportation noise has caused the most harm to the soundscape. As transportation technology advances, so does access to more remote lands. This trend is likely to continue in the 21st century. There are two additional lessons that are worth noting. First, catastrophic events tend to end noise control efforts. In the 20th century, noise control efforts, which were quite strong until 1929, virtually stopped during the Great Depression and World War II, and did not recover until the late 1950s. In my predictions about the future, I’ve assumed that we don’t encounter additional worldwide catastrophic events that may push noise control to the back burner. Global warming, economic collapse, and even another world war have much worse consequences for humanity than for the soundscape, but they would have a huge impact on the soundscape as well. Second, there will undoubtedly be noises in the 21st century that we can’t imagine. People living before 1900 could not have imagined 250 million cars in the United States, some of them equipped with car alarms or 1,000 watt sound systems. Even for sounds we can imagine, predicting what will actually happen is difficult. 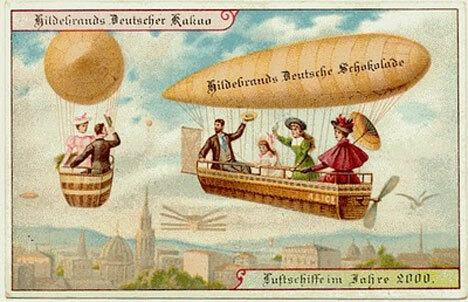 Figure 6 is a post card depicting what people prior to 1900 imagined air transportation would be like. As we examine the 21st century, two key questions stand out. What will new technologies do to the soundscape, and how will government respond to them? How these questions are answered will largely determine whether the 21st century is the loudest or the second loudest in the history of the world. The first thing to note about the 21st century is that it will be the end of the Fossil Fuel Era of Noise. The electron will likely be the preferred source of noise-making power. In general, electric vehicles, tools, and appliances are quieter than gas-powered ones, so initially, lower noise levels are possible. 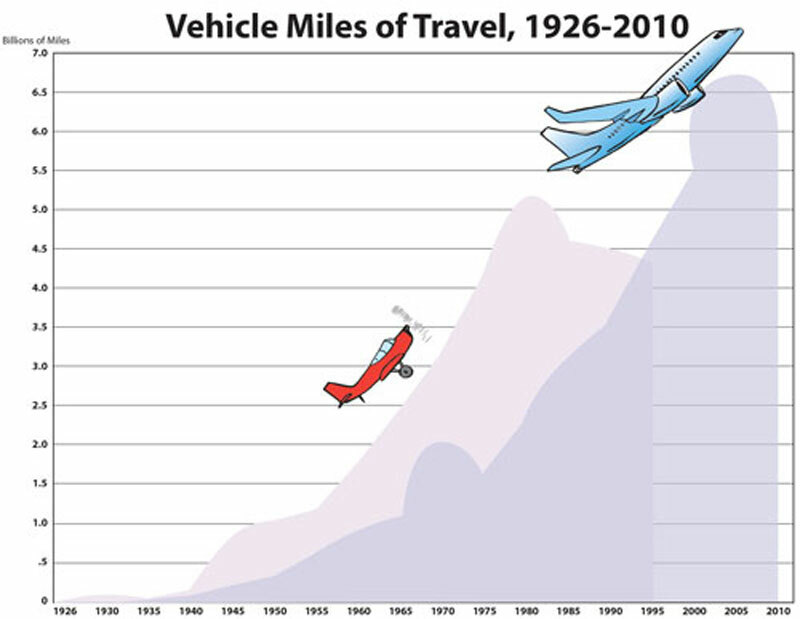 But the speed of travel in the 21st century is likely to increase, which may lead to more noise. Two prognostications, more than 50 years old, hint at our possible dystopian future. The most obvious candidates for the next noisy technologies are drones (unmanned aircraft) and some version of a flying car. It seems very likely that in the 21st century, we will do to the air what we did to the land in the 20th century, filling the sky with the modern day equivalent of free-ranging Harleys. 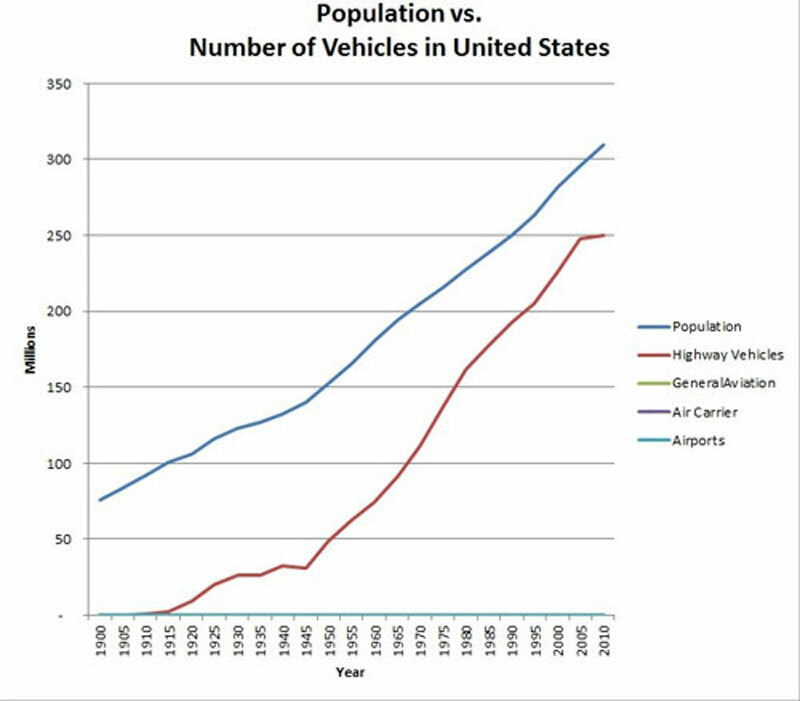 There is a great potential market for flying craft as the technology is developed and a 21st century Henry Ford makes it available to the masses.This potential can be seen (or not seen, as airplanes and airports are indistinguishable from the horizontal axis) in Figure 9. For much of the 20th century, the car was playing catch-up to the population. Now we have more vehicles than people of driving age. The same thing could happen to aircraft in the 21st century. Drones are already in use, and it is only a matter of time before a flying car is developed. Where will these craft take off and land from? Will we turn our neighborhoods into airports or will we see an explosion of small airfields? In the 21st century we may well lose our ability to escape noise. The issues surrounding new aviation technology aren’t limited to noise, and some of them may actually limit the acoustic assault to some degree. There are concerns about midair collisions, interference with commercial aviation, and terrorist attacks against vulnerable facilities such as bridges, nuclear power plants, and chemical manufacturers. Another issue with new aviation technology is privacy. Who has the right to the airspace above private and public lands? Should drones be allowed to fly above a person’s home, or a national park? These are important questions that must be answered in the 21st century. How government responds to new flying technologies will be critical. Unfortunately, the FAA, which currently regulates aviation noise, seems uniquely unqualified to regulate the emerging industry and reverse the loss of natural quiet. Given its history of supporting expansion of airports, opposing curfews and limits to aviation noise, and even fighting against protecting our National Parks from aircraft noise, there can be little doubt that if drone and flying car regulations are left to the FAA, the 21st century will be the noisiest in history. There is, however, some chance 21st century aviation regulations will be more responsive to noise impacts on homes. In the 20th century, the wealthy and powerful were for the most part able to avoid the noise and pollution from transportation. That is unlikely to remain the case in the 21st century, primarily due to aircraft. Moreover, as FAA officials’ and U.S. Senators’ homes are more interesting surveillance targets for drones then your home or mine, it seems likely the government will be more responsive to people living below aircraft in the 21st century. In the 20th century, noise control primarily meant controlling product or source noise levels. In the 21st century it is likely that we will also control its use. Perhaps the greatest change related to noise in the 21st century may be how we think about it. With the growing body of scientific evidence showing direct health effects, noise will eventually be more closely associated with health effects, and no longer be viewed as just an annoyance. The transition from an annoyance problem to a health problem has already begun, with major new research on the cardiovascular effects of noise pollution attributing as much as 2% of heart related deaths in Europe to noise pollution . Likewise, a Harvard study around 89 US airports found that 2.3% of cardiac-related hospitalizations among older people were due to aviation noise . The recognition of noise as a significant health threat will have profound consequences. Public policy makers are much more responsive when people are dying, or at least shown to be in the process of dying. This shift away from considering noise as only an annoyance will lead to a significant change in our definition and conception of noise. The 20th century definition of noise as unwanted sound describes noise that is annoying, but it utterly fails to describe noise that is harmful. Moreover, unwanted sound is one of the most unscientific definitions ever employed by scientists, and has never “really” been used in the acoustics field, in the sense that scientists have never bothered to invent a desire meter to measure the unwantedness of particular sounds. As the objective health effects of noise become clearer, people will begin to think of noise as sound that interferes with, or harms, health or well-being. One consequence of the long overdue death of the definition unwanted sound is that noise will lose some of its subjective connotation and its focus on the receiver. During the 20th century, psychologists have pretty extensively studied the psychology of noise perception. Since noise is a pollutant that engages one of our senses, this was appropriate, but what was ignored in the 20th century was the psychology of the noise makers. In the 21st century, we’ll be less likely to blame the victim and more concerned about why some people feel they have to impose noise on others. The 20th century began with efforts to eliminate unnecessary noise , and by the late 1920s, we were using the latest technology to both measure and control it . Then, noise control efforts were set back by nearly 40 years, due to the combined impact of the Great Depression, World War II, and the post-war flight to the suburbs. Noise control reemerged briefly in the 60s and 70s, only to be snuffed out in the 1980s by political conservatism opposed to environmental regulations. As the 21st century begins, noise control efforts at the city level have reemerged. People realize that they can no longer reliably escape noise by moving to the suburbs or gated communities, and instead, seek to make the places they live quieter. What is new is that noise control efforts are emerging in wild lands. Just as the loss of wild lands in the 19th and 20th centuries resulted in efforts to preserve what natural lands remained, continued loss of quiet will likely strengthen the movement to protect the quiet of national parks and other natural lands. By noise, I’m referring to human-caused or anthropogenic noise. EPA, 1974, Information on Levels of Environmental Noise Requisite to Protect Public Health and Wellfare with an Adequate Margin of Safety, B-3. Blomberg, Schomer, and Wood, May 2003, The Interest of the General Public in a National Noise Policy, Noise Control Engineering Journal, Volume 51, Number 3, pp. 172-175. The other key question is, how many people will be around to make noise? We know that the population will likely grow in the 21st century. The US Census predicts around 400 million people in the US and 9.5 billion worldwide by 2050. Barring a cataclysmic event, there will be more people making noise. WHO, 2011, Burden of Disease from Environmental Noise. Dominici et al., October 2013, Residential exposure to aircraft noise and hospital admissions for cardiovascular diseases: multi-airport retrospective study, British Medical Journal. Julia Barnett Rice founded the Society for the Suppression of Unnecessary Noise in 1903. Emily Thompson, 2004, The Soundscape of Modernity.